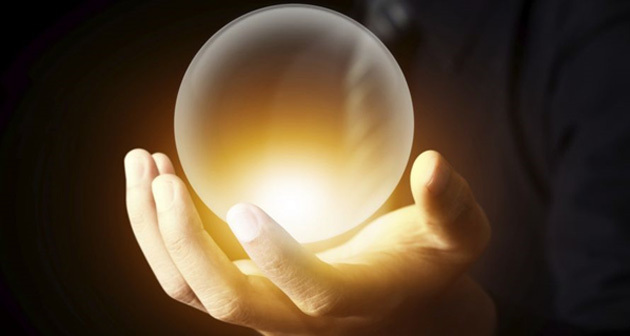 If you can identify a pattern in economic cycles or market activity and have enough observations to make your observation statistically significant, it raises your odds of success. That’s why John Mauldin’s Strategic Investment Conference is such a boon. Last week, he gathered some of the world’s most brilliant investment thinkers in one place and let them speak their minds. I heard some things I didn’t especially like, but there is no true bliss in ignorance, no matter what the folk wisdom says. Today, I’ll tell you about one of speakers and what I learned from him. I started reading Martin Barnes probably 25 years ago when I worked at ProFutures. My boss, Gary Halbert, was a big fan and let me read his copies of the very expensive Bank Credit Analyst, which Barnes edited for many years. BCA doesn’t always catch short-term moves, but its long-range macro outlook has been reliable. I was thrilled to finally meet Martin in person last year at the Camp Kotok economists’ retreat—and this year, I got to hear him speak at the SIC. The bottom yellow line represents the current recovery, which has produced less GDP growth than prior cycles. 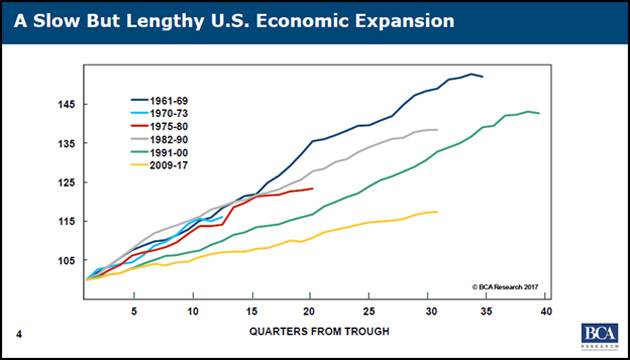 But in terms of length, it is now tied for third place, surpassed only by the 1961–69 and 1991–2000 expansions. The bigger problem is that other macro trends aren’t helping. 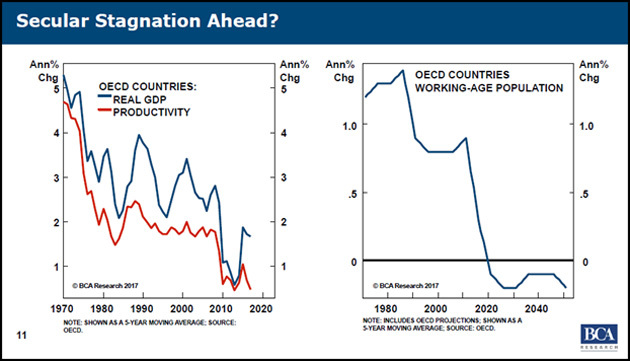 Worker productivity and working-age population are problematic already, and they will likely get worse. This being the case, Martin thinks we can’t expect the kind of investment results seen in prior expansions. Over long periods, stock market growth has to track economic growth. Market gains since 2009 reflect good news that hasn’t actually happened yet. Which brings us to the bad news I mentioned. Martin thinks the 2% average real GDP growth of this expansion will likely continue for the next decade—and in the long run, stock benchmarks can’t grow more than the economy in which they operate. That means net investment returns will stay around 2% as well. Here’s what BCA expects, broken down by asset classes. Worse, many public pension funds still assume their portfolios will earn 7–8% nominal returns and make promises to workers based on that assumption. If Martin is right, this is not going to end well for either workers or taxpayers. Also at the SIC was George Friedman of Geopolitical Futures. He said something in an entirely different context that fits here too. To George, this means the US has to assume North Korea’s nuclear capabilities are real, and act accordingly. To investors, it means we shouldn’t assume 7% real returns will continue. Maybe Martin is wrong and the market will zoom higher in the next decade—but your retirement plan shouldn’t bet on it. In other words, keep your expectations conservative. Better to be surprised by a windfall than a shortfall. Specifically, you can start by tempering your retirement lifestyle plans. That could mean pushing back your planned retirement age, living in a less expensive home, or renting out part of your house to lower expenses. You could also save more aggressively for retirement, which might require reducing your current spending plans. You’ll be glad you did later. 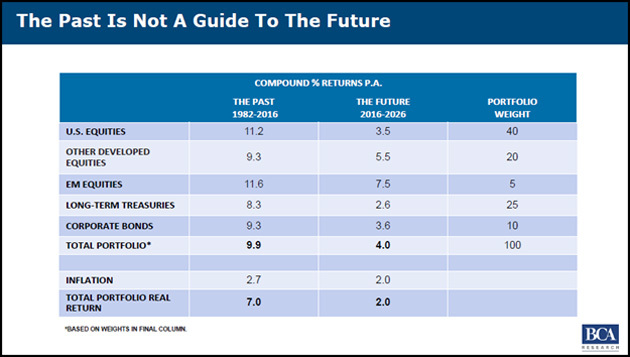 You‘ll notice in the BCA forecast that they expect the highest future returns to come from emerging-market (EM) equities. I agree—which is one reason I recently recommended a reduced-volatility emerging market ETF to Yield Shark subscribers. It’s up almost 3% so far but still has plenty of room to grow. P.S. If you weren’t at the SIC, check out our Live Blog for highlights. You can also still buy a Virtual Pass that includes full audio, written transcripts and slides from all the speakers. Click here for more information. May 30, 2017, 11:56 a.m.
Be careful about becoming a Landlord - Lawyers refer to rental property as a “high risk” asset and recommend an LLC operation to protect your other assets.